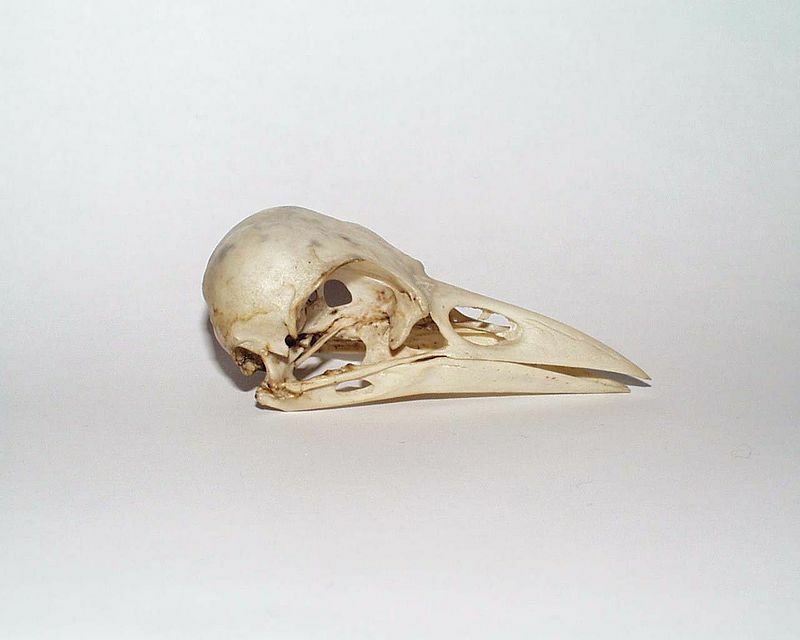 Corvus corone skull. Courtesy of Wikimedia Commons. “I have fled in the shape of a raven in prophetic speech.”- John Matthews and Caitlin Matthews, The Last Celtic Shaman. In 2011, crows brought me a warning. Whenever I walked the nature trail behind my apartment, they cawed at me and followed me. When I left the path to go home, they cawed and continued to follow me. I left them offerings of bread and shiny silver items. They kept following me. A few weeks later, my familiar pet guinea pig Minerva was put down for her illness. After that, the crows ceased their cawing and stopped following me. Now, I tense whenever I pass the crows on the nature path. Crows and ravens have been both loved and reviled as they have flown next to humans for thousands of years. It is small wonder the that Goddess Morrigan (and other Deities such as Odin, Apollo, Bran the Blessed, Shani, as well the Raven of Native American and Siberian mythologies) favored these notorious carrion birds for their intelligence and cunning. They represent death, the underworld, and the darker aspect of life most mortals fear. The people of ancient Ireland, the British Isles, and Western Europe were a proto-Celtic tribal group who date back to the Iron Age. Animists, they believed that there was a soul in all plants, animals and natural phenomena. The Celts prayed to the forces of nature for protection. Carrion birds, mainly crows and ravens, were renowned in Celtic religion, and were representative of death, the underworld, and rebirth; they were also associated with the sun and light. Their magickal qualities included prophecy, knowledge, eloquence, and trickery. In Ireland, the popular phrase “raven’s knowledge” refers to an oracular gift to see and know all things, and to possess strong intuition. Birds were regarded as prophetic and their ability fly from the earth symbolically represented the spirit when freed from the body. * When a crow consumed the meat of the fallen warriors, the crow guided those souls to the underworld. The Druids performed bird augury, studying the flight patterns and behavior of ravens and crows. Ravens possessed knowledge from the Otherworld and their speech resembled human speech. In Celtic mythology, the Morrigan — the Goddesses Macha, Badb, and Anu — are associated with war, battlefields, death, and sovereignty; she/they shape-shift into crows or ravens. Dating back to the Copper Age, she was the dominant Dark Death Goddess of Ireland, Wales and Britain. She is one of the original members of the Tuatha De Danaan (People of the Goddess Danu), an intimidating and fierce Goddess of sovereignty. The Morrigan exists between the worlds of life and death. The Irish War Goddess Macha is one of the three Morrigans. Macha is a horse goddess. She returned from the dead to foretell the future, and is strongly associated with queenship and sovereignty. She is connected to the rich fertile earth and to the hooded crow, which is a carrion bird. Her colors are red and brown. The herbs sacred to her are coltsfoot, vervain and oats, and the gemstones are garnet, quartz and citrine. Badb is the second aspect of the Morrigan. She is a Maiden and a Crone Goddess of the Underworld. She flies over battlefields and causes panic and frenzy amongst the warriors. Her correspondences are the colors white, blue and red; the herbs juniper and holly; and the gemstones are onyx and jet. Her totem animals are the hooded crow and the hawk. Make an offering to her of dark red wine, which symbolizes blood of death and rebirth in a ritual. Anu is the third aspect of Morrigan, honored as a fertility Mother Goddess. Anu is the Mother of the Gods. She is known by twin hills in County Kerry in Ireland. Her correspondences are the colors green and the brown of freshly tilled soil. Gemstones such as moonstone, emerald, and quartz, and plants such as apple and mugwort are sacred to her. Cattle are her totem animals. In the Ulster Cycle, the Morrigan appears to the hero Cuchulainn and offers him her love. He refuses to recognize her (or the sovereignty that she offers him), and she tells him she will hinder him in battle. When he refuses to love her, she shape-shifts into an eel, a red cow, and a wolf, and he injures her each time. When Cuchulainn is grievously wounded in battle, she settles on his shoulder in the form of a crow. Later in the Cycle, she appears to him as the Bean Nighe, Washer at the Ford, cleaning his clothes. In so doing, she declares that he will die soon. Cuchulainn rejects the Morrigan’s love and so suffers her ferocious wrath. The Morrigan rules over death and the underworld. She dwells in shadows and the battlefields. Invoke her as the death goddess or in one of her other aspects. It is not recommended for a novice practitioner to invoke her. Learn about the Morrigan, yes, but find another deity to worship first. She will understand if you are hesitant, but will be there when you are ready to dedicate yourself. Black or dark blue silk or cotton cloth. Morrigan statue (at the head of the altar). Crow or raven figurine (next to statue). Black or dark blue pillar candle. Mugwort or patchouli essential oil to anoint the candle. Red, black and white candles. A white candle to represent the dead. Incense (mugwort, rosemary, sage, patchouli, thyme, frankincense, myrrh, and marigold). A crow or raven feather. Cleanse the sacred circle, then cast the circle and call the quarters according to your tradition. Stand at the altar and light the candles. Be brave in your heart and sincere in your intent. Perform this ritual on a new or full moon outside, or indoors where the moon is visible. Open the window to draw in the moon’s energies. Feel charged by her power as it flows through you and blesses you. Take a moment to stand and draw down the moon. Feel it fill you from head to toe. Visualize yourself transforming into a crow or raven: your arms become wings, your nose a beak, your legs shorten. Take flight. Seek out the Goddess. Go where she calls to you. Return from your journey, and visualize yourself changing back. Thank the Goddess Morrigan for her blessings. Let the candle burn down. Leave offerings such as milk, wine, honey, mead, apples and oats. She may leave crow or raven feathers at your door as gifts. Crows and ravens may follow you everywhere you go. Heed your dreams and put offerings on the altar and outdoors on a regular basis. *Attitudes towards the corvidae changed with the conversion to Christinaity. During the Middle Ages, people believed sorcerers used the symbol of the Crow’s foot to cast death spells. The black plumage of crows and ravens was associated with darkness and evil. Woodsfield, Stephanie. Celtic Lore & Spellcraft of the Dark Goddess. Invoking the Morrigan. Woodbury, Minnesota, Llewellyn Worldwide, 2011. McColman, Car and Hings, Kathryrn. Magic of the Celtic Gods and Goddesses. Franklin Lakes, NJ, New Page Books, pp. 55-61. Green, Miranda. The Gods of the Celts. Stroud, Gloucestershire, The History Press, 2011. D’Este, Sorita and Rankine, David. The Guises of the Morrigan. London, England, UK, Avalonia Books. Conway, D.J. Maiden, Mother, Crone. The Three Faces of the Goddess. Woodbury, Minnesota, Llewellyn Worldwide, 1994. Savage, Candace. Bird Brains: The Intelligence of Crows, Ravens, Magpies, and Jays. San Francisco, Sierra Club Books, 1995. Thank you for this. I was called by The Morrigan some time ago and any information on how to honour her in my practice is good.